About short-circuit protection, IEC898 and GB10963 are divided into A, B, C, D four types. British standard BS3871 is divided into 1,2,3,4 type. However, VDE0641 / 6.78 (German standard) and CEE (formerly European Community Electrotechnical Commission standards CENELEC abbreviation) standards are not classified. Type A: Especially suitable for transformer protection in measuring circuits, circuit protection with extra-thick conductors and limited semiconductor protection (its overload and long-delay protection ranges are the same for categories B, C and D). Short circuit protection range is 2In ~ 3In, that is, ≤2In no action (no action time should be greater than 0.1s)  greater than 3In must be action (action time t <0.1s). However, Type A users rarely. 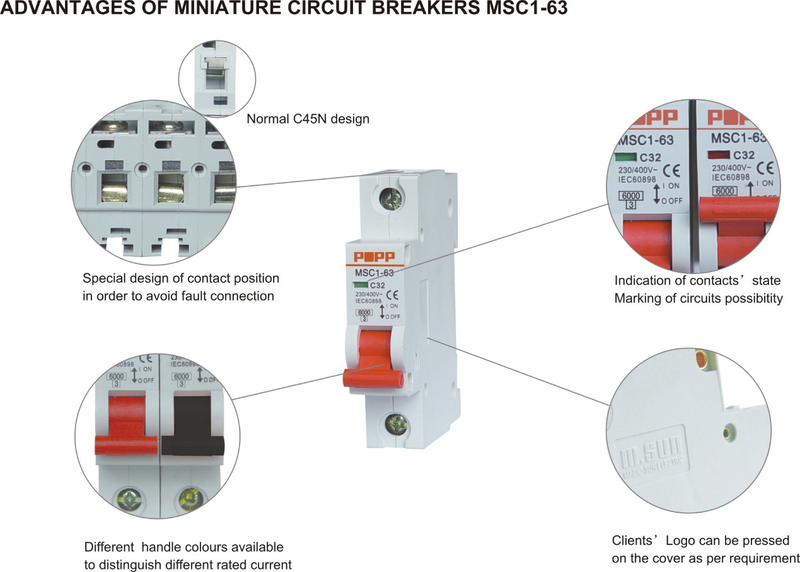 Miniature circuit breaker short-circuit protection types generally do not mention the A class, while the provisions of B, C, D three types (type). Type B: for residential and outlet circuits. Short circuit protection range is 3In ~ 5In, ie ≤3In no action (no action time should be greater than 0.1s)  greater than 5In must be action (action time t <0.1s). Type C: Preferentially used to switch on high-current electrical equipment such as lights and motors. Short circuit protection range is 5In ~ 10In, ie ≤5In no action (no action time should be greater than 0.1s)  greater than 10In must be action (action time <0.1s). Type D: Suitable for generating pulse current electrical equipment, solenoid valves and capacitors. Short circuit protection range is 10In ~ 50In, that is, ≤10In no action (no action time greater than 0.1s), more than 50In must be action (action time <0.1s). Type A> 2In, <3In; Type B> 3In, <5In; Type C> 5In, <10In; Type D> 10In, <50In. It can be understood as the action is qualified, not action is also qualified. Currently, the choice of B, C two models more (for the protection of street lamps, whether it is incandescent, fluorescent, halogen lamp, high pressure mercury lamp, high pressure sodium lamp, metal halide lamps, etc., their starting current rating Current 4 times to 7 times, it must choose C type). D-type is also used as a small motor short-circuit protection. Such as C45AD and PX200CAD and other models. Their momentary current setting is 10 times to 14 times In (factory adjusted at 14In). This type of D-type products do not set long delay protection. Over-current protection by the motor protection circuit in the thermal relay commitment. Motor start and stop, by the implementation of the contactor, they only serve as a short circuit protection.